For the EGRET satellite mission, see Energetic Gamma Ray Experiment Telescope. Egrets /ˈiːɡrət/ are herons which have white or buff plumage, and develop fine plumes (usually milky white) during the breeding season. Egrets are not a biologically distinct group from the herons and have the same build. Many egrets are members of the genera Egretta or Ardea which also contain other species named as herons rather than egrets. The distinction between a heron and an egret is rather vague, and depends more on appearance than biology. 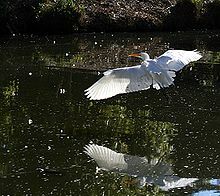 The word "egret" comes from the French word "aigrette" that means both "silver heron" and "brush", referring to the long filamentous feathers that seem to cascade down an egret's back during the breeding season. Several of the egrets have been reclassified from one genus to another in recent years: the great egret, for example, has been classified as a member of either Casmerodius, Egretta or Ardea. In the 19th and early part of the 20th century, some of the world's egret species were endangered by relentless plume hunting, since hat makers in Europe and the United States demanded large numbers of egret plumes, leading to breeding birds being killed in many places around the world. 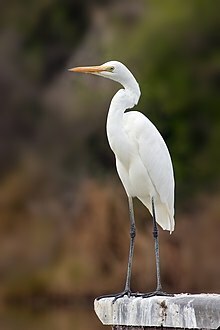 Several Egretta species, including the eastern reef egret, the reddish egret, and the western reef egret have two distinct colours, one of which is entirely white. The little blue heron has all-white juvenile plumage. ^ The Cornell Lab of Ornithology. 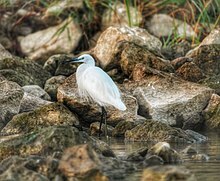 "Egret". All About Birds. Cornell University. Retrieved 11 August 2015.